Whale Cove A104 is a four-star rated, three bedroom, two bathroom luxury apartment in DE KELDERS,GANSBAAI, with secure on site parking. The apartment is equipped with sound and vision devices and a full DSTV bouquet is included in our high season package. Contemporary books, dvd�s and cd�s which guests are welcome to use during their stay. 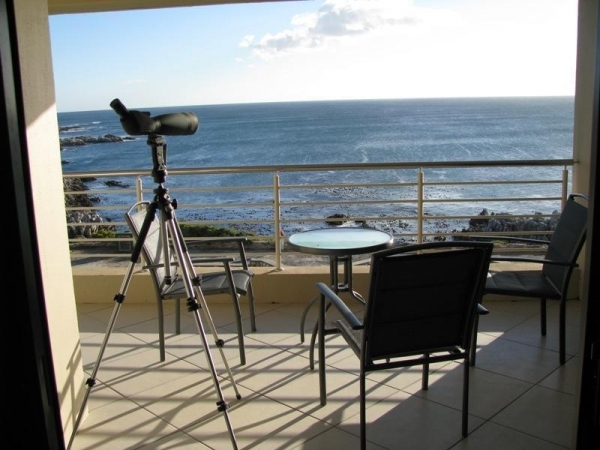 A spotting scope is available for precision viewing and guests can enjoy a barbeque on the balcony by using the apartment's Weber gas braai.